Start reading Gangsta Granny on your Kindle in under a minute. I liked the granny who turned into a master criminal with her grandson. 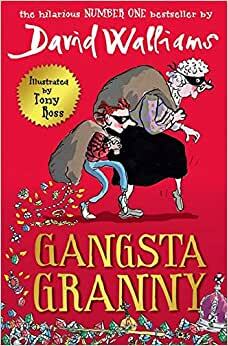 The best chapter in the entire book of Gangsta Granny is Postscript or something like that.I really liked this book because David Williams created awesome characters with his great imagination.I thought the end was sad because the Gangsta granny dies in her bed. She also likes to eat a soup her grandson doesn't like. It was an amazing story! I really liked that the Granny who was boring to begin with, became a master criminal! I would recommend to anyone 9 years and older. Really enjoyed this book my 10 year thoroughly enjoyed the plot. A great blend of laughter and tears. cabage cabage cabage.To much cabage. Granny stinks cabage and all mum and dad care about is ballroom dancing. But it turns out every granny has a story. what happens when he looks in the biscuit tin. David waliams uses humour and suspence to teach us that grandparents arnt just cabage soup they each have a diferent story to tell.I am ten and this book is definitely recommended for my age group.